A few months ago, Glenn Fleshler was relatively anonymous to most television audiences, save for those who knew him as George Remus, Boardwalk Empire’s self-referential Cincinnati crime boss. Now he’s got a spot on TV’s Mount Rushmore of sickos: His arc as True Detective’s inbred, kidnapping, mass-murdering, lawn-mowing man-boy Errol Childress concluded last night with spectacular violence. Twelve hours removed from the series’ end, Fleshler tells Vulture that he is relieved to be unmasked and just hopes to avoid sideways looks when he takes his kid to the playground. He spoke to us about Errol’s psychology and what went into creating such a stirring eight hours of television. What was it like to wake up today as TV’s most terrifying villain? 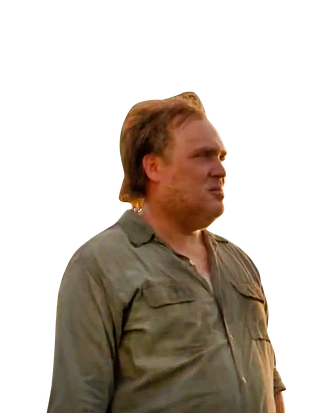 Oh, it’s just another day in the life of Glenn Fleshler. I’ve played a lot of scary people in my life. I’m always being told I’m so scary. I feel like an ordinary guy. But, actually, it’s a great relief because I’ve been carrying this around for over a year and haven’t been able to talk to anybody about it. I’ve gotten very funny text messages and emails over the last couple of weeks. Beyond that, I’m just trying to figure out how I can continue to take my toddler to the playground. Did you receive all the scripts for True Detective at once? I didn’t. I could have, possibly. I did read everything … I kept going back to the script guy and going, “It all sort of affects my character. I could use script five and script seven.” I think I read the whole series a couple times through. Most people, when [a show] is historic like this, say you couldn’t have really known — but I knew it was extraordinary right away. And you knew right away you were the show’s big, bad villain? Yeah, I knew that from the audition. Once you were cast, how did you start inhabiting Errol? I think I first auditioned September of 2012, so it’s been about a year and a half of thinking about this guy, combing through the scripts and picking out all the information I could. [Series writer-creator] Nic [Pizzolatto] didn’t share an awful lot with me. I had started to Google all the Carcosa/Yellow King stuff, and a lot of video-game stuff came up, and I wasn’t familiar with those stories at all. He basically told me not to worry about it. The helpful thing he said was my mind was a hall of fun-house mirrors due to the years of abuse. So I tried to not think about the grand scheme too much and think about each individual moment and what was going on to make it as personal as I could. When I started to think about the actual life this guy lived, I remember working on the scripts late at night while my wife and baby were sleeping and crawling into bed with my wife and just being in tears ‘cause it was so painful to think about the big picture. But most of the work was spent on the detail. I did a lot of watching of the Andy Griffith shows, which were referenced in the original script, and some of the movies that were referenced. Those references changed as new drafts came in, but spending time on that and trying to hone the character. It’s this very tricky balance, because I think [series director] Cary Fukunaga was concerned it would come off like some classical actor, which I am. And as a kid, I was an impressionist, so I had that experience. And I think that’s very much the experience Errol has, a guy who had trouble speaking as a kid, who’s a product of inbreeding and a lot of abuse early in his life, so it was indicated that there was a cleft-palate kind of sound to his real speaking voice, so he probably spent a lot of time watching somewhat dated material. The original references in the script were piles of videotapes of things that were probably from the ’50s and ’60s, which is a sort of eerie touch, to keep him in another era. Is Errol a more sophisticated psychopath or feral man-child? It’s a combination of those things, because there is clearly damage there, and he is able to transport himself into different mythos. But he also has grown up in a culture of sexual abuse and ritualistic abuse, so it’s a labyrinthine mind-maze, if I can sound McConaughey-ish about it. To go into the details of what his life is like is like the Yellow King story itself. It’s too crazy. It almost sounds as if you found sympathy for Errol. Well, that’s the job. I had to get inside the guy’s skin, and I can’t judge him. And I think with [co-star in “Form and Void”] Ann Dowd, we found a childlike nature to [this] strange brother and sister living in this house, stuck in another era, full of rot. It’s like these two are kind of grown children left together, watching these old movies and living this perverse life. [Errol] isn’t the originator of this. I think that’s what’s implied in the line “My family’s been here a long, long time,” which ended the seventh episode, that this is a cycle of violence. That’s not to say he’s solely a victim, but that he is definitely a product of that cycle. And you can see by the scars on his face that he’s had it pretty bad himself. Not to say that justifies all of the behavior, but it’s definitely what he’s a product of. And the idea that he can kind of snap into different characters to be out in the world and hide in plain sight, those are things I do find relatable. That also indicates a level of sophistication to his psychosis. I think so. There’s definitely a lot of capacity there in his mind, but it is warped and refracted in very atypical ways. Is shooting a scene where you and your half-sister have foreplay difficult, or do you just trust the director? There’s always a bit of a leap in that sense, but that scene really evolved on the day. There was no indication the scene was going to end quite that way. It was just the nature of what I was pursuing and what Ann brought to the table and the by-play between us. And I remember Cary said, “I didn’t see that coming.” He was surprised by the product, but it was inspired by what Nic wrote and how we just kind of played off each other. Despite the fact that [Pizzolatto] says he’s not that interested in serial killers, he took those scenes very personally. I remember finding him alone to do a read-through of episodes seven and eight, and he was really twisted up about those characters, and he had to throw himself into that mind-set as well. So I think they were pleased we brought that little level of empathy to those characters. It almost seems like Errol and his half-sister really love each other. Possibly, but it’s very complicated. She has survived, so that was as much of a clue as I could take, is that she survived with him in that house for that long. They made it work to that extent. Whatever level of dysfunction that is, they survived this long together coming out of this madness of a family. Are you ultimately relieved to shed the second skin of Errol? I absolutely am. I’m also delighted that people have had such a fascination with the show. I find it to be groundbreaking work, so I’m proud to be a part of it. In some weird way, all the acting I’ve done over the last 25 years or so has been training for this role in a lot of different way. So I’m very proud of it, but yes, I’m glad that it’s out there and in the canon now and I can move onto other things.